Chichester Ship Canal Trust has recognised the significant contribution made by one of their very long-standing volunteers. Linda Wilkinson, who died in 2017, was a trustee for many years and trust chairman in later years. Ian Milton, trust chairman, said: “Linda was invited to join the canal trust in the very early days of the restoration in the late 1970s, and she made an immense impact on getting the canal restored. 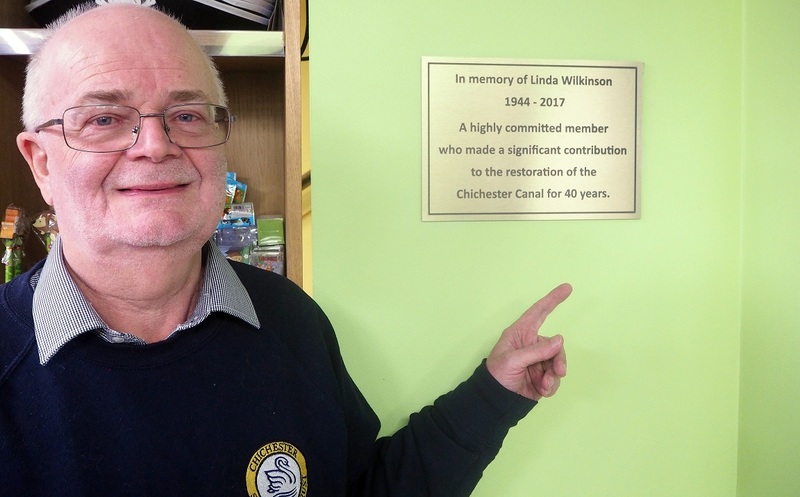 A plaque has been installed inside the canal cafe, which reads: ‘In memory of Linda Wilkinson 1944 – 2017 A highly committed member who made a significant contribution to the restoration of the Chichester Canal for 40 years’. The plaque installation was attended by a number of canal volunteers. Many visitors and residents may not realise that the canal is almost entirely volunteer-run, relying on people throughout the year. The volunteers take on an extraordinary range of activities at the canal, including tow-path maintenance, serving refreshments on boat trips, being a skipper, archiving historic photos and being a trustee.